Here is part two of the series, I will have part three up next week. ENJOY. Lie face up, knees bent, feet flat the floor, extend arms above your head, aligned with your ears, fingers interlaced, keep abs pulled in at all times. In 2 counts, lift your arms, head and shoulder blades off the ground and lower in 2 counts. 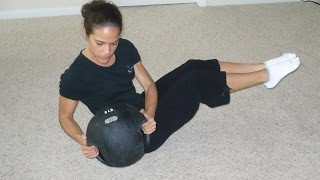 Two ways to make the above exercise more intense perform the exercise on a stability ball and/or hold a 4-6lb medicine ball and crunch away. Lie face up on the floor, hands by your sides, and lift feet straight up, toes pointed to the ceiling. Contract your abs and lift your hips and glutes off the floor, feet still pointed to ceiling. Hold this position for 1-2 counts and lower to floor. 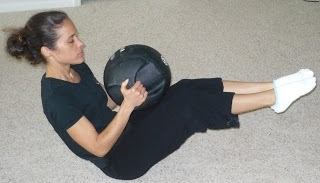 To make the above move harder hold a medicine ball or a weight with your feet. Lie on your back, legs extended to the ceiling, arms extended overhead. in a V position with your legs straight and your hands reaching toward your feet. Hold for a count and on an inhale slowly lower to the starting position. 4. Medicine Ball Russian Twist 2 Sets 16 reps (each right/left rotation is 1 rep). Sit on the floor, upper body tilted back, abs engaged at all times, knees bent and feet off the floor, hold a medicine ball at chest height. Rotate torso with control from side to side, (move from the waist). If you don’t have a medicine ball a dumbbell can be used. 5.Waist Crunch/Leg Lift 2-3 Sets 10 Reps each side. Lie on your right side, placing your right hand on the side of your head, legs straight and stacked, with a slight bend at the knees. Place your left hand in front of your body; this is to help with your balance. Lift your upper and lower body at the same time hold for 1-2 counts, lower and repeat. Switch sides. Bonus Moves:You all know I have to include a plank variation or two. Love them. Clock Plank Waist Hold 1-2 Sets 6 reps each side. Get into the straight arm plank position, abs pulled in. Imagine a clock, 12,3,6,9 reach 1 hand out to each “time”. Then using the same hand grab your waist and hold for 1 count. Repeat with the opposite hand. Lie on your side, with your forearm on the floor, knees bent. 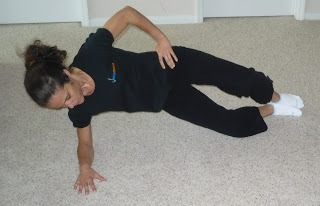 Place your free hand on your hip, lifting hips off the floor, hold for 3-4 counts. Then open and close your knee, keeping heels and toes together through out the exercise. Remain lifted for each rep.
Just a reminder, keep your abs pulled in and up through out the day, while running, sitting at your desk, doing the laundry etc, you will be strengthening abs, and no one will know. Lie face down, legs stretched behind you. Contract your abs to lift your navel in toward your spine, and stretch your arms overhead with your palms facing the floor. On an exhale lift your right leg and left arm up and away from the floor. On an inhale switch the legs and arms, reaching the left leg and right arm up as you lower the right leg and left arm. Keep abs pulled and lifted throughout and squeeze your glutes to protect your lower back. Hope you enjoy these exercises. As always if you have questions feel free to ask. My plan is to have a series of workouts, combining Pilates and strength training over the next several months. My question to you all is what would you like next after the final part of this series? Would you like upper body, lower body, medicine ball training, exercises using the bosu, pilates exercises using the magic circle etc?? Next few weeks I will also be posting a GIVEAWAY.